Call Me Mrs. Miracle is the sequel to Mrs. 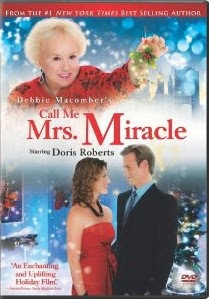 Miracle, a 2009 Hallmark movie both starring Doris Roberts as Mrs. Merkle. In Call Me Mrs. Miracle we find Mrs. Merkle working in a family's department store in New York. The store is struggling and 'Mrs. Miracle' has her work cut out for her when trying to make sure that the family comes together to have a good Christmas. Fans of Call Me Mrs. Miracle will be thrilled to discover that this 2010 Hallmark movie has been released on DVD and is available right now from Amazon. Click here to order your copy of Call Me Mrs. Miracle or Mrs. Miracle from Amazon. See what Christmas movies are coming from Hallmark in 2011.